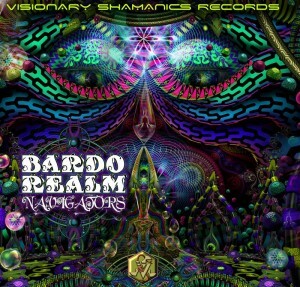 Visionary Shamanics is proud to present Bardo Realm Navigators, a long-awaited compilation elegantly assembled by DJ Spacepops and Mystical Voyager. With a strong focus on forest and darkpsy elements, this release brings together dedicated artists from all over the world to share their twisted and turbulent creations. Let the universe dissolve as the as reality comes undone and a strange aura erupts from the passionate minds of these cosmic architects. Bit by bit, they rebuild the land that surrounds them in a brilliant collaboration. INTENSE SHAMANIC PATTERNS AND COLOURFUL FRACTALS PORTALS RESONATE. Mastered at Overdream Studio by Markus from Ukraine., with artwork by Hakan Hisim. MP3 Download | FLAC Download | WAV Download · Download count: 13,093. Twisted and turbulent, a colorful flux dissolves the reality of a distant universe. As the world shakes, a strange aura erupts from the passionate minds of cosmic architects. Bit by bit, they rebuild the land that surrounds them in a brilliant collaboration. The typical soon becomes the magical. The expected evolves into the unpredictable. An organic chant erupts from the gathering, oscillating vibrations never before witnessed. Perplexed by creation, the laws of existence bend. The wizards beckon forth the dawn of a new age and shout into the suns. They dance together in a mighty roar, altering the tides of time. A shimmering portal rips open, surrendering all to the majestic Navigators of the Bardo Realm. They now invite us into their kingdom, where incredible sounds are born. Prepare yourself for a truly unique experience, elegantly compiled by Spacepops and Mystical Voyager with the well known Visionary Shamanics label. With a strong focus on Forest and darkpsy elements, Bardo Realm Navigators brings together dedicated artists from all over the world. Good quality, floor stomping madness! An intense collection. Great work!! One of the best comps I’ve downloaded from here in a long time. Excellent tracks all the way through. AMaZinG Compilation , truly one of this years best ! Great and very energetic ! Absolutely wonderful journey, the sample in the first track really sets the scene for our intentions to be directed at the Great Mother, from whom we have all been born.Keep on releasing quality original music…..
I’ve played this through dozens of times now! A much appreciated creation! @Apocalypse – Glad u dig man! This is absolutely incredible. Truly and intensely psychedelic. Thank you to every person involved in the making of this beauty.